Despite the immense popularity and fame of the New Order in highsec, some miners are still a bit surprised when they watch things blow up in the ice fields. This is because highsec miners, in their bot-aspirancy, are the most disconnected players in the game. They don't want to know what's going on in EVE; they'd prefer to keep their eyes trained on whatever chunk of rock they're mining at the time. The New Order to the rescue! 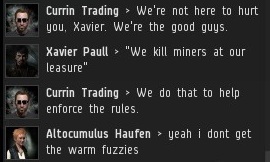 It's our mission not only to govern the miners of highsec, but to educate them. Once we give them the tools, miners can help us make it easier to mold them into proper EVE players. 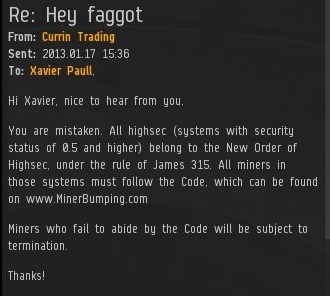 A day later, Xavier Paull finished writing this heartfelt EVEmail to me. If that's not a cry for help, I don't know what one is. I am not merely a military and political leader, I am also the Educator-in-Chief of highsec. I have provided valuable information to countless miners across the galaxy. Not every project is an easy fix. Some miners need more work than others. 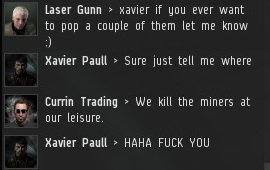 That's why it's a good thing highsec has a Saviour with a "no miner left behind" policy. Give us enough time--months, years--you won't even recognize highsec! 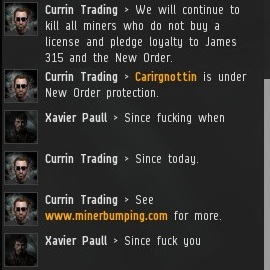 I wonder if there is any correlation between mining and anger issues. Are people brimming with internal rage predisposed to become miners? Or it the lack of fulfillment that comes from too many hours spent mining that causes the anger? Either way, we know the cure, and we're dispensing it as fast as we can. This would be a fascinating and worthwhile avenue of investigation for our Department of Space Psychology. What you are seeing is not anger issues. It is what happens to some people when the fantasy of how they THINK things should be comes into conflict with reality. "Because we so often build the structure for our lives based on what we truly hope and believe “should” and “will” happen…when what we believe SHOULD happen is not happening, it causes tremendous CONFLICT. It causes us to question everything we believe in ways that cause incredible pain, fear, anxiety and depression." Thus the claims by the miners that we "can't" do what we are doing. In an ironic way, since this is a fantasy game, we are bringing reality to the miners in a bumpily wrapped package of gank. We are dealing with mental illness here, people. And I agree, The Code is The Cure. Highsec is worth fighting for. 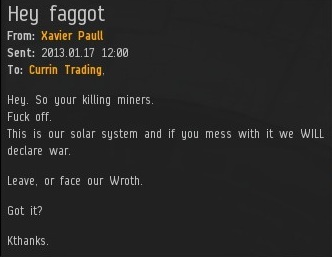 I don't agree with the whole "we own highsec, give us 10m a year and worship us and follow the code we've put together or we'll kill your ship and pod you" thing. But I do agree that you should be able to play the game this way if you wish and I sincerely hope CCP don't nerf highsec pvp. I don't agree that you should expect everyone to have heard of you, and those that haven't just don't pay enough attention and it's all their own damn fault. But I do agree that those who have heard of you should accept that they're screwed now because of your size, and unless one of the many, many, many "we'll get james!" groups actually does get something together, they should just pay the 10m and keep their expensive ships safer. It is both entertaining and saddening to watch the reactions of some of the miners. The anger is astounding. Giving out real life death threats.. I mean.. just.. talk to a therapist, seriously. However simulation-ary eve is, however addictive it is, when you start making death threats because you lost a ship in a game, you need to learn to control your anger. In my 6 week old experience with this game, I have observed one basic difference between "carebears" and pvpers.. the carebears whine and want everything nerfed to their advantage, whereas the pvpers learn to adapt and deal with what's given to them. The carebears throw gigantic tantrums when they lose their ships, whereas the pvpers (with a few exceptions) shrug it off as part of the eve experience and get a new ship. Sorry carebears, this is how eve works. Whether you like it or not, whether you agree with it or not, this is how it is. If it's not to your liking then eve isn't for you. 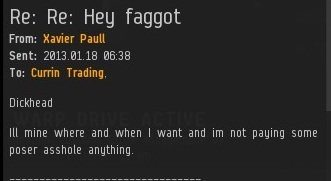 "In my 6 week old experience with this game....... etc"
I think you'll do in EVE. Congrats you understand the game better than some "vets" (aka carebears). I can actually attest to a lack of people in-game not having heard of the New Order outside your area of operations. 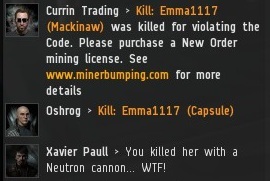 I had never heard of the New Order myself until I happened to see a New Order corp in a war history, and that was just over three months into my time in eve.